Hitting a brick wall isn’t really very scary, when bureaucrats have been building brick walls in your face for two years. A sudden oncoming embankment at 50 mph triggered defiance in me, at that amorphous fate that picked me tonight to splatter. It was a metaphor for what my life has become at the hands of others: and possibly avoiding it is foreshadowing of things to be. So it was to be the end for me on a murky stretch of Sunrise Highway just east of Carlton Avenue at 8:30 p.m. on a misty Fall Saturday night. It was an end I refused to accept. A blood clot, an autonomic storm, or the melanoma, maybe, but this, I would not tolerate. It was the perfect end to a perfect day. By nightfall, I had totally forgotten where I was in the horrific timeline of my life, for one sweet day. This morning, I decided to seek some normalcy, after almost two years isolated in bed by intractable pain in a small dark hotel room, peering through the horrible distorted haze my life had become at the hands of FEMA and the Disaster Recovery System: which has tormented, dismissed and abandoned tens of thousands of east coast Americans for two onerous years in the wake of Hurricane Sandy. 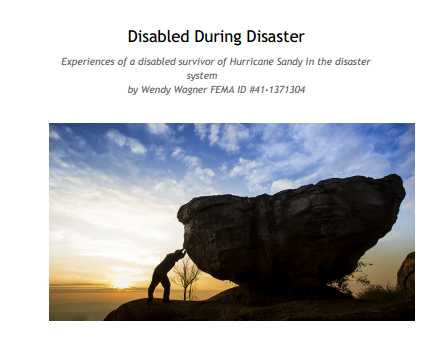 I was an advocate for disabled people, an ADA Consultant, a hero to many, before SuperStorm Sandy blasted all of our lives into slivers of contaminated memories, muck, and hideous bureaucratic incompetence: before FEMA disrespected us all. I awoke today wanting to touch the person I was before the sewage surged into my comfortable home, contaminating everything I owned with putrid slime and importing bullies in government boots into our neighborhoods. I longed to hold yesterday in my hand, to validate my past, if only for a moment. I decided to go to the East End and inspect a Village for disabled access, like everything was normal. I drove the same route east that I had driven for all the years of my volunteer work on the East End. But I was different now, a stranger in my van: scarred, profoundly sad, numb, disbelieving, so pensive: the last two years running in front of my car. I was desperate to shed the ugliness of bureaucrats and the insanity of the Disaster Recovery System I was forced to operate within since Hurricane Sandy. I longed to recover the contentment and security of my life before Sandy. I longed to recover me: if only for one day. With every mile I drove away, I felt the muck of my mutilated life crust and drop away: shedding layers of indignity and abuse. I was in the moment, with shafts of sunshine and balmy breezes prying at the edges of my profound sadness, soothing me, reviving me. Miles of lush rejuvenated scrub Pines stretched along the highway, recalling the Sunrise Fire of 1995, a series of major brush fires in the Westhampton area in late August, that razed 7,000 acres of the East End Pine Barrens and closed down Sunrise Highway for days. I remember smoke engulfed the area with days of fear the fire would spread to East End towns. This stretch of highway brought back the fires for me. As I passed Shirley, I always remembered the mysterious explosion over the Atlantic Ocean near East Moriches, of TWA’s Boeing 747 Flight 800 on July 17, 1996: reports of missile strikes, cover-ups, recovery, memorials and monuments on the beach at Smith Point County Park. I remembered the crowds of rescue vehicles and boats, months of mystery, conflicting eyewitness reports and major inconvenience. The land was reverberating its history, triggering memories of my involvement in the pattern of the past. I forgot where I was in time and suddenly realized life is not all about FEMA. There is life outside of FEMA Hell. The breeze dried tears I spontaneously shed for the loss of my place in line. Layers of the hypocrisy and hatefulness of others toward me fell away. In the distance, I saw the person I lost as a result of the horrible failures of the Recovery Systems and the bureaucratic maze of incompetence after Hurricane Sandy. Lost in thought, time passed quickly. I pulled into the Village peaceful, anticipating a productive afternoon of purposeful work in quiet solitude, inspecting access accommodations. But, I was immediately reminded that this was a day to celebrate Fall harvests. There was a banner stretched above Main Street announcing the event, and what seemed like thousands of people lined the sidewalks, here to party on this exquisitely beautiful day. I was a wounded warrior walking through the Mardi Gras: returning from two years isolated in one dark hotel room with officials of FEMA and NYRising bashing me. Hoards of well dressed people walked across the intersection I designed, in the walkway I relocated, down the curb cuts I made safe for them, using the traffic lights I timed to accommodate a wheelchair user. They didn’t know the work that went into that one intersection, or who I was. I was ingrained in the history of this place, coming home to nourish my broken heart. I knew the people here would not help me to go home: most were tourists, here to soak in the ambiance, perhaps some seeking solace too, like me, in a beautiful place. I knew the townspeople would not help me, despite seventeen years of expertise I gave to the Village: because when my house went down, I put fliers around the community and spoke to people, to no avail. I was beyond looking for someone to rescue me. I belonged here. I went to the disabled parking space created for me behind Village Hall, but they were renovating Village Hall, and my space was full of construction materials. I evaluated and modified architect plans for access for this renovation years ago. I drove to Main Street and parked in the disabled space on the corner of the Lane and Main Street. As I exited my Rampvan, there were people everywhere, living today, using the walkways, parking, intersections I designed: in flip flops and shorts, holding hands, laden with purchases, pushing strollers, bikes, carrying antiques and large paintings, colorful balloons, popcorn, ice cream cones, walking dogs on leashes. I felt my people, without homes, walking beside the beautiful people, shivering and invisible. I was one of them. I crossed the intersection, while singers on every corner, with guitars, drums, and keyboards, filled the Village with melody. I rode slowly west on the Lane, homeless and wounded, reluctant to be visible, watching life go by. Joyful people looked at me like I was one of them. I loved them for their innocence. I wanted anonymity and acceptance today. Tomorrow was time enough for truth and pain. As I traveled west, waves of people crowded past my large powerful wheelchair on the narrow sidewalk. Every one of them looked me in the eye and said “Good Day.” I was in awe of the moment: hoards of ambling people were open and sweet and only wanting to relax on this brilliant Fall day. I was here: now. They validated a part of life that I had not known for a very long time and forgot existed. I decided to absorb the moment, and to make a second pass through the Village later for my access inspection. seat. In the left, a bouncing, giggling toddler in lavender overalls held the leash of a large, dignified, meticulously-groomed black poodle. The dog wore a red t-shirt with the letters “Baby Sitter” written in black, with a red bow above each ear. As I passed, the man smiled at my maltese and said, “Adorable.” I smiled at their silly poodle taking himself so seriously, and forgot that I was homeless, and alone. Across the street, by the Art Gallery, several voices and guitar performed too loud, “Who will Stop the Rain,” as fans sat on the wall visualizing gentle showers. My mind filled with tidal waves, long dark corridors of Disaster Recovery and mold. I needed to move on. Two laughing girls in pink jeans skipped across the sidewalk in front of the Confectionery, swinging, twirling, tossing their long yellow curls. I saw that their faces were painted beautifully with pretty delicate pink and white flowers. There was a sign that read, “Face Painting.”. I loved them for their uninhibited joyfulness and their innocence. But relentlessly the children of the Storm back in FEMA Hell were tramping through my mind: watching their parents slowly die of want and bureaucratic abuse, trying to get back home. We all needed a day in the sunshine. As I approached the park, I noted signs for the restrooms I designed were newly painted. I was startled by a tangled crowd of people strewn across the lawn enjoying the festivities.. I was swamped with visuals. People and concessions, wandered all the way to the lake. Strollers criss-crossed the park, as children ran, arms outstretched, with delighted abandon. Children sucked on candy apples, ice cream cones and cotton candy. Five young boys ran in circles in the middle of the lawn, playing tag with a barking Golden Retriever. Two tiny Yorkies, dragging streamers, ran up to me and looked up. Pollyanna stood up, ready to play. They turned and ran back to their security, satisfied my mass was not a threat. The Retriever stuck his silken head under my left arm, snuggled and slobbered a moment, then ran away. The sweet fragrance of corn on the cob and sauerkraut teased me. I was hungry. People sang Ballads, Rock, and songs of the Sixties, all mixed together in one loud divergent symphony, overstimulating. A woman from the pet store across the way chatted about my service dog and invited me to participate in the Pet Parade in three weeks. Everywhere, everyone acknowledged me with pleasant conversation. No one knew that I was different: homeless. So it went. It was a golden day of friendly people and sensory stimulation. I was cautiously happy, because I knew that I did not own a place in life right now. But it felt good to walk through the world of the living, if only for a day. Main Street was more of the same, pleasant people sitting at tables, eating meals outside at curbside restaurants along the sidewalk, with friendly dogs beside them on leashes: people smiling at me, not away. It was difficult to receive unconditional acceptance, after being battered and dismissed for two years in the Disaster Management System. But I was here, now, and I never wanted to leave. In front of Village Hall people sat on bales of hay, on benches, on the sidewalk, while a woman sang Cher’s song “You Haven’t Seen the Last of Me.” She sang, “Feeling broken Barely holding on But there’s just something so strong Somewhere inside me. And I am down, but I’ll get up again. Don’t count me out just yet.”. I knew she was singing just to me, so I stopped and listened with appreciation. I felt like the crowd understood. Before I left the Village, I went to Dune Road to complete my access inspections, and rested in my van on a hill overlooking the ocean, while my service dog hung her tiny head out the window and fell asleep to the hissing of the ocean across the sandy shore. I inspected the phone booths I had put out on Dune Road, and was proud that I had fought so hard for them. I watched Cranes and Osprey glide across the marshland as far as I could see, and horseshoe crabs move like magnets in unison in the sea grass beneath my feet beside Road D: a phenomenon I look forward to witnessing each fall. The bright sun fell low over Dune Beach and closed its eyes on a day well done. As I was leaving Dune Road, miniature deer nibbled at the lush lawns of sea-side estates: I was honored, peeking into their secret sanctuary, witness to their vulnerability. As I drove away from the solace of familiar environments, filled with the nourishment of blue skies, the rhythm of the ocean, the chatter of friendly people, and productive work, I was content. I listened to Bobby Vinton and sucked on hot cinnamon candies. Pollyanna was fast asleep under a pink bunny blanket in her car bed beside me, exhausted from being adored all day by strangers. Riding west, back to SuperStorm Sandy homelessness, to the place where I belonged before the storm but is uninhabitable now, felt cold. The trip back home was usually a time of sweet reflection: replaying the day. The East End turns very black after the sun sets, and no matter how delightful is the day, once darkness falls, I always want to go home. But, by the time I get to Babylon, it feels like I am at a carnival, with all the bright lights and busy, colorful businesses on Sunrise Highway and, I long to return to the Long Island “country.”. Today was different. With every mile, I rode closer to life on hold: to the horrific reality of the failed Disaster Recovery System in America, to FEMA Hell, to NYRising litany of broken promises. As night descended, the friendly faces of strangers celebrating the Fall season, was juxtaposed against abandonment of Sandy Survivors. Reality always resurfaces when the light of day fades. I was driving in traffic moving smoothly along at the speed limit, when without warning the gross hand of fate turned the path in front of me into hellfire. Suddenly the car in front of me swerved to the left and sped away. It seemed strange, until I saw directly in front of me in the road, looming unavoidable, two large jagged metal objects that looked like file cabinets: in my face! I braked, but not completely because there were cars behind me. I had no recourse! Head on collision was imminent. I wondered what idiot dropped these off a truck onto the roadway and kept driving with total disregard for others. I was angry at incompetence and apathy. The cars around me sped away. My van lurched forward and I swerved to the right, seemingly out of control. I heard all my salvaged belongings falling off the rear seat. I was not afraid. After living the last two years in FEMA Hell, I had no fear. I was in survivor mode. It was a mine field. I just missed the huge metal objects, swerving toward the cement wall. I had nowhere to go: no time to think. I braced for collision I could not avoid. Was this the end of me? I held tight onto the steering wheel of the lurching van, and refused to let go. I took all the hatefulness and injustice directed at me in the last two years navigating the Disaster Recovery System, and channeled it into defiance. I would not let go!. Holding tight, I swerved to the left, just enough to narrowly miss the wall: finding a path between the metal objects and the wall, not quite wide enough. It seemed like hours, but it was only moments: a lifetime. I felt a blow. I knew I was hit. But, I kept my hands firmly clutching the wheel, anticipating the final blow, trying to navigate the crevice between the offending objects and the concrete wall, as I had navigated through the maniacs at FEMA. I felt strangely calm and in control. I would not allow the last two years of my life in FEMA Hell to be the story of my life. In the final analysis, hitting a brick wall is nothing, after being walled up behind the brick walls of the horrific Disaster Recovery System in America. There is nothing worse than losing control of your life, through no fault of your own, to corruption, incompetents, profiteers and egotists in important jobs. Brick walls! I heard a loud crack. I waited for an explosion, oblivion. But there was only the road, and me: and a direction for me to choose. I chose Home! My mind was clear. The van was weaving away from obstacles. My path was clear. I held the wheel so tight it seemed it would break. My eyes were fixed on the path home. I was invincible. The road was dark. I was alert. I wanted to stop and look at the damage, but I was afraid someone might hurt me on the dark road. My chest hurt terrible. My foot was on the gas and I kept it there. I called to inform authorities of the obstacles in the roadway. I pulled into the brightly lit hotel parking lot, afraid to look at my van, but needing to just the same. The thought of dealing with fixing the damage, in addition to dealing with the inept disaster management system, was too much to think about tonight. I turned, in order to transfer into my wheelchair, and realized for the first time that everything was pinned against my seat, the wheelchair being held from me by a blue ice cooler cracked in half. The back bench seat was tilted forward, jammed upside down by the ceiling. All of my belongings were piled against me, having cascaded from the seat onto the wheelchair. One of the leg rests to my power chair was cracked. The van was a jumble of yesterday: odds and ends of a life put on hold by natural disaster and bureaucratic incompetence, hopefully unbroken, because they were packed in styrofoam. I felt grateful as I piled boxes all over the front seats, and others pulled the broken seat off the ceiling.. After much effort, the seat swung into a horizontal position, obviously bent and out of place. I put the suitcases and blankets back on the seat, unjammed my wheelchair, sopped up ice water on the floor, lifted Pollyanna from her fleecy nest, and exited the vehicle. I was anxious to see the external damage to my wheelchair van. I scanned the front of the van, the side, the hood, the other side, the doors. There was no gaping hole, no smashed fenders, no broken lights. I was confused. There were huge obstacles in the road on my way home. They hit me hard. I held on tight. I would not let them vanquish me. I got a flashlight and rode around the van once more, meticulously inspecting every inch for evidence: front, back, hood, both sides. On the edge of the side panel in front of the left tire on the drivers side, there was a deep, ruler-straight seven-inch gouge imprinted, but not cut all the way through: a scar. An inch below that, perfectly parallel, was a second three-inch gouge. It was obvious the corner of the file.cabinet had clipped me as I navigated between it and the cement wall, leaving a graphic reminder that reaction works. I closed my eyes and whispered, “Thank you God!” three times. I wondered why God gave me this one. At daylight, I rushed out to look at my van, wanting to validate that something really happened. The two cuts looked like deliberately-placed deep knife wounds. But, overnight each had developed a black line down it’s center, that looked strangely like a scab. Was healing possible?